WARNING: This drug may infrequently cause serious (rarely fatal) bleeding from the stomach or intestines. This side effect can occur without warning at any time during treatment with diclofenac. The elderly are at increased risk for serious stomach/intestinal bleeding. Nonsteroidal anti-inflammatory drugs (including diclofenac) may rarely increase the risk for a heart attack or stroke. The risk may be greater if you have heart disease or increased risk for heart disease (for example, due to smoking, family history of heart disease, or conditions such as high blood pressure or diabetes), or with longer use. This drug should not be taken right before or after heart bypass surgery (CABG). Stop using diclofenac and seek immediate medical attention if you notice any of the following rare but very serious side effects: black/bloody stools, persistent stomach/abdominal pain, vomit that looks like coffee grounds, chest pain, shortness of breath, weakness on one side of the body, sudden vision changes, slurred speech. USES: Diclofenac patches are used to relieve pain from various conditions (e.g., sprained ankle). This medication is known as a nonsteroidal anti-inflammatory drug (NSAID). If you are treating a chronic condition such as arthritis, ask your doctor about non-drug treatments and/or using other medications to treat your pain. See also Warning section. HOW TO USE: Read the Medication Guide provided by your pharmacist before you start using diclofenac and each time you get a refill. If you have any questions, consult your doctor or pharmacist. The patch comes in a resealable envelope. When opening the envelope for the first time, cut it open as instructed. Remove a patch from the envelope and reseal the envelope. It is important to reseal the envelope after each opening, or the remaining patches will not stick correctly. Before applying the patch, remove the clear liner. Apply the patch to the skin to cover the most painful area. Do not apply the patch on burns, cuts, or irritated skin (e.g., eczema). Change the patch usually every 12 hours or as directed by your doctor. Fold the used patch in half with the sticky sides together, and discard out of reach of children and pets. If the patch begins to peel off, you may tape the edges to the skin. Do not wear the patch during bathing or showering. Take baths/showers at times that you normally change the patch. To avoid getting the medication in your eyes, nose, mouth, or vaginal area, wash your hands after handling the patch. If the medication or patch does come in contact with those areas, flush with plenty of water. Contact your doctor immediately if irritation persists. Dosage is based on your medical condition and response to treatment. To reduce side effect risks (e.g., stomach bleeding), use this medication at the lowest effective dose for the shortest possible length of time. Do not increase your dose or use it more often than prescribed. Discuss the risks and benefits with your doctor or pharmacist. If you are using this drug "as needed" (not on a regular schedule), remember that pain medications work best if they are used as the first signs of pain occur. If you wait until the pain has worsened, the medicine may not work as well. Tell your doctor if your pain persists or worsens. SIDE EFFECTS: See also Warning section. Itching, burning, irritation, redness, or dry skin may occur at the application site. Nausea or change in taste may also occur. If any of these effects persist or worsen, tell your doctor or pharmacist promptly. Remember that your doctor has prescribed this medication because he or she has judged that the benefit to you is greater than the risk of side effects. Many people using this medication do not have serious side effects. Tell your doctor right away if you have any serious side effects, including: swelling of the ankles/feet/hands (edema), sudden/unexplained weight gain, unusual tiredness. This drug may rarely cause serious (possibly fatal) liver problems. Get medical help right away if you have any symptoms of liver damage, including: dark urine, persistent nausea/vomiting/loss of appetite, stomach/abdominal pain, yellowing eyes/skin. A very serious allergic reaction to this drug is rare. However, seek immediate medical attention if you notice any symptoms of a serious allergic reaction, including: rash, itching/swelling (especially of the face/tongue/throat), severe dizziness, trouble breathing. This is not a complete list of possible side effects. If you notice other effects not listed above, contact your doctor or pharmacist. In the US - Call your doctor for medical advice about side effects. You may report side effects to FDA at 1-800-FDA-1088. In Canada - Call your doctor for medical advice about side effects. You may report side effects to Health Canada at 1-866-234-2345. PRECAUTIONS: Before using diclofenac, tell your doctor or pharmacist if you are allergic to it; or to aspirin; or to other NSAIDs (e.g., ibuprofen, naproxen, celecoxib); or if you have any other allergies. This product may contain inactive ingredients, which can cause allergic reactions or other problems. Talk to your pharmacist for more details. This medication should not be used if you have certain medical conditions. Before using this medicine, consult your doctor or pharmacist if you have: aspirin-sensitive asthma (a history of worsening breathing with runny/stuffy nose after taking aspirin or other NSAIDs), recent heart bypass surgery (CABG). Before using this medication, tell your doctor or pharmacist your medical history, especially of: stomach/intestine problems (e.g., bleeding, ulcers), kidney disease, liver disease, poorly controlled diabetes, heart disease (e.g., heart failure, history of heart attack), high blood pressure, stroke, swelling (edema, water retention), a severe loss of body water (dehydration), blood disorders (e.g., anemia, bleeding/clotting problems), asthma, growths in the nose (nasal polyps). Before having surgery, tell your doctor or dentist that you are using this medication. If you are going to have an MRI test, notify testing personnel that you are using this patch. Serious burns may occur during MRI tests because of the aluminum contained in these patches. It should be removed just before the MRI test or consult your doctor for specific instructions. This medicine may cause stomach bleeding. Daily use of alcohol and tobacco may increase your risk for stomach bleeding, especially when combined with this medicine. Limit alcohol and stop smoking. Consult your doctor or pharmacist for more information. This medication may make you more sensitive to the sun. Avoid prolonged sun exposure, tanning booths, and sunlamps. Use a sunscreen and wear protective clothing when outdoors. Older adults may be more sensitive to the side effects of this drug, especially stomach/intestinal bleeding and kidney effects. Before using this medication, women of childbearing age should talk with their doctor(s) about the benefits and risks (such as miscarriage). Tell your doctor if you are pregnant or if you plan to become pregnant. During pregnancy, this medication should be used only when clearly needed. It is not recommended for use during the first and last trimesters of pregnancy due to possible harm to the unborn baby and interference with normal labor/delivery. Based on information from related drugs, this medication may pass into breast milk. While there have been no reports of harm to nursing infants, consult your doctor before breast-feeding. DRUG INTERACTIONS: Your doctor or pharmacist may already be aware of any possible drug interactions and may be monitoring you for them. Do not start, stop, or change the dosage of any medicine before checking with your doctor or pharmacist first. Before using this medication, tell your doctor or pharmacist of all prescription and nonprescription/herbal products you may use, especially of: aliskiren, ACE inhibitors (such as captopril, lisinopril), angiotensin II receptor blockers (such as losartan, valsartan), cidofovir, corticosteroids (e.g., prednisone), cyclosporine, desmopressin, digoxin, lithium, methotrexate, pemetrexed, probenecid, tenofovir. This medication may increase the risk of bleeding when used with other drugs that also may cause bleeding. Examples include anti-platelet drugs such as clopidogrel, "blood thinners" such as dabigatran/enoxaparin/warfarin, among others. Check all prescription and nonprescription medicine labels carefully since many medications contain pain relievers/fever reducers (aspirin, NSAIDs such as celecoxib, ibuprofen, or ketorolac). These drugs are similar to diclofenac and may increase your risk of side effects if taken together. However, if your doctor has directed you to take low-dose aspirin to prevent heart attack or stroke (usually at dosages of 81-325 milligrams a day), you should continue taking the aspirin unless your doctor instructs you otherwise. Ask your doctor or pharmacist for more details. This document does not contain all possible interactions. Therefore, before using this product, tell your doctor or pharmacist of all the products you use. Keep a list of all your medications with you, and share the list with your doctor and pharmacist. OVERDOSE: This medication may be harmful if swallowed. If overdose or swallowing is suspected, contact your local poison control center or emergency room immediately. US residents can call the US National Poison Hotline at 1-800-222-1222. NOTES: Do not share this medication with others. Laboratory and/or medical tests (such as complete blood count, liver and kidney function tests) should be performed periodically to check for side effects. Consult your doctor for more details. Keep all doctor appointments and lab visits so your therapy can be monitored closely. STORAGE: Store patches in the envelope at room temperature at 77 degrees F (25 degrees C). Brief storage between 59-86 degrees F (15-30 degrees C) is permitted. Always reseal envelope after opening. The patches expire 3 months after the envelope is first opened. Keep all medicines away from children and pets. Do not flush medications down the toilet or pour them into a drain unless instructed to do so. Properly discard this product when it is expired or no longer needed. Consult your pharmacist or local waste disposal company for more details about how to safely discard your product. I had knee surgery 1 yr. ago. Still having pain. 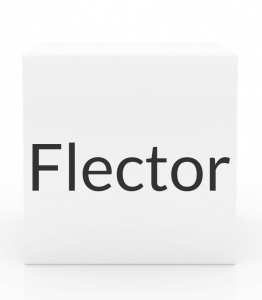 My Dr. finally wrote a percription for Flector Patch. This patch is wonderful & does the job. Now Medicare will not let me get this anymore & replaced it with a cream which DOES NOT do the job. I cannot afford to get this patch on my own. Anyone with knowledge of how I get this. Please let us know!! !